P. ‘Damsel’s Delight’ (foot), P. ‘Betty Myles Young’ (centre), both polyploids, and the Common Passion flower (top ). 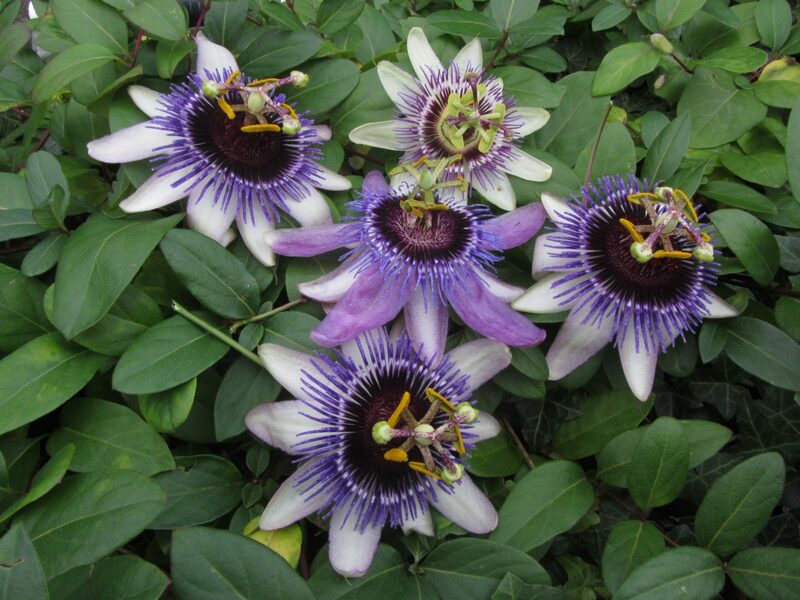 The earliest known Passion flower hybrids were created in the early 19th century. Since that time hundreds of hybrids of these fabulous flowers have been created, of which sadly many have been lost over the years. Few are hardy however and fewer still are polyploid, Polyploidy means having more than the usual two sets of paired chromosomes. A single set is called haploid, a pair diploid, (humans are diploid), three sets triploid & four sets tetraploid. Some plants, like many commercially grown strawberries, have as many as eight sets, which is called octoploid. Polyploidy is one of Nature’s ways of speedily adapting to environmental change, with tetraploids occurring as a spontaneous mutation naturally in the wild. An example of this is the white P. incarnata polyploid above, found by breeder Ethan Nielsen. Polyploidy is of interest to plant breeders as it can give rise to easy to care for plants with larger stronger flowers that stay open for longer, bigger thicker leathery leaves, longer petiole glands and more vigorous and hardy plants. For example see the Riverside® Hybrids. Note that unless you are certain one or both of the parents are polyploid there is a minimal chance of a hybrid you have produced being polyploid. 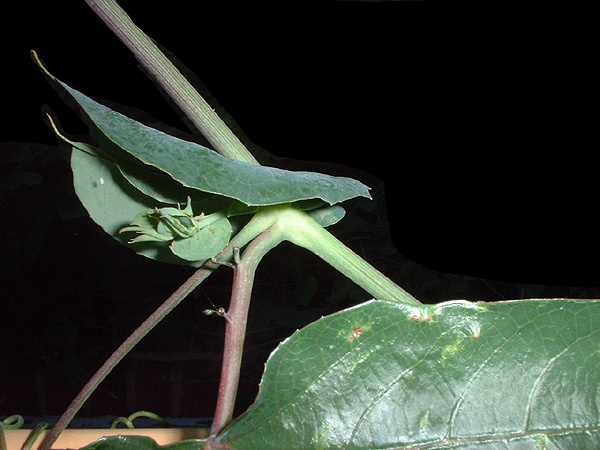 Some diploid Passiflora, especially P. caerulea hybrids are large vigorous plants with strong shiny leaves. From New Jersey Dept. Health & Senior Services. 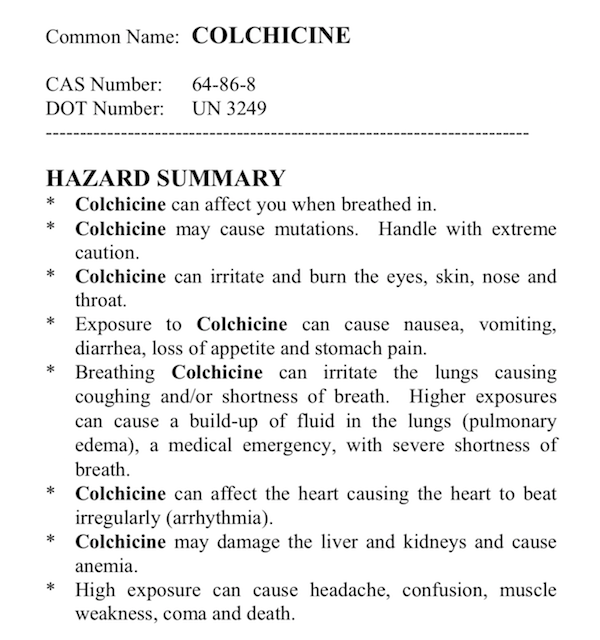 Colchicine is a toxic alkaloid extracted from Colchicum autumnale. It is used on mitotic cells to interfere with the natural process of cell division. Sometimes not all the tissues in a plant will have the same increase in chromosomes, which can cause some oddities e.g runners reverting back to diploid from tetraploid. It is also possible to cross polyploids by pollination in the usual way but with greatly diminished chances of successfully producing something novel. 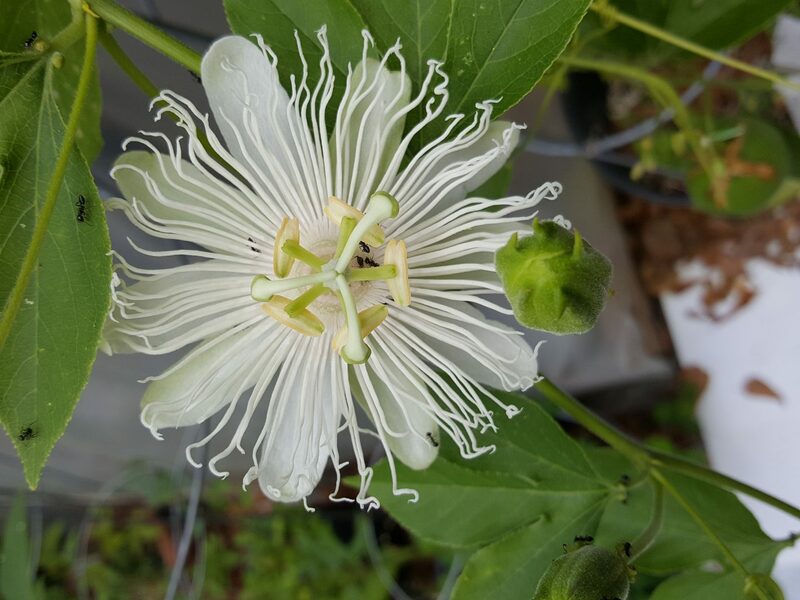 Passiflora are diploid, meaning that they have 2 copies of each chromosome. For most Passiflora, but not all, 2n (the number of chromosomes) =18, so their pollen or egg cells are half that, n=9. Tetraploid plants have 4n=36 chromosomes & their pollen usually 2n=18. Thanks to Dr. Robert Knight (USDA) we have the first tetraploid hybrid, P. ‘Byron Beauty’. More recently Dr. Roland Fischer has also created tetraploid species selections such as P. ‘Clear Sky’ & P. ‘Emil Kugler’ which are both selections of P. caerulea and also some spectacular tetraploid hybrids such as P. ‘Byte’, P. ‘Jara’, P. ‘Inspiration’ & P. ‘Temptation’. More breeders worldwide are now working with these amazing plants but progress is not easy. This means that a number of diploid hybrids, including ones previously thought sterile may be able to cross with tetraploids. It is also likely that some hybrids and species will produce a small number of unreduced pollen grains which could be used to set fruit on tetraploids to produce fruit containing tetraploid seed.